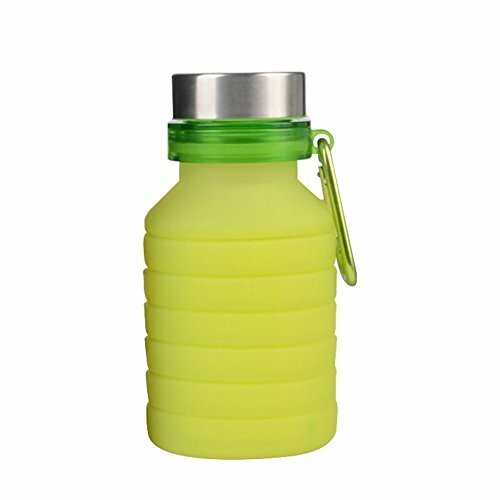 PROKTH 550ml Outdoor Collapsible Cup Travel Silicone Cup Portable For Outdoor Retractable Kettle Water Bottle for Outdoors,Hiking,Camping,Biking,Sports Traveling by PROKTH at H For Care. MPN: PROKTH. Hurry! Limited time offer. Offer valid only while supplies last. Made of the European standard food grade silicone that is resistant to heat and cold. Purely silica gel production. The silicone cup body can withstand the highest temperature of 240 degrees, and the lowest low temperature of minus 60 degrees. This new concept product is safe, non-toxic and environmentally friendly. The cup body is soft, foldable and easy-to-carry and has been the best choice for cycling, self-driving tour, backpacking, outdoor sports and fitness. It's foldable and telescopic and comes with a carabiner. 2. Made of the European standard food grade silicone that is resistant to heat and cold. Purely silica gel production. The silicone cup body can withstand the highest temperature of 240 degrees, and the lowest low temperature of minus 60 degrees. This new concept product is safe, non-toxic and environmentally friendly.